Many of you took advantage of our June rare ancient coin offering of the Byzantine gold nomisma. We are excited to bring to you another opportunity to put an extremely important rare ancient coin in your collection or portfolio. Before we get into this month’s offer, let’s take a closer look at why ancient coins are presently an excellent opportunity, in particular, the potential effects of last month’s new stipulations on the German law for the Protection of Cultural Heritage. Under these stipulations, German law severely threatens the collection of cultural objects by private individuals, and includes 20-year proof of provenance and other reporting rules that are nearly impossible to satisfy for coins valued over 2,500 euro. It is likely similar legislation could spread throughout Europe, drastically reducing supply of ancient coins to the U.S. market, and driving up value of high-end specimens. Despite these looming restrictions, ancient coins are liquid in an international market. Where are ancient coins collected? The answer to this question, simply put, is everywhere! Ancient coins carry with them the history and art of Ancient Greece and Rome, relics of the foundation of Western Civilization. Unlike U.S. coins primarily collected stateside, the international interest in ancient coins reflects the impact of the remarkable history that made Western Civilization what it is. From the earliest coins known to man, to the time of Alexander the Great, Julius Caesar, Christ, and the Byzantine Empire, these coins are tangible pieces of thousands of years of history with immense value, and they are only getting better. When it comes to buying and selling a coin, one of the greatest challenges is agreeing on an objective quality and the state of preservation. With the 2008 advent of NGC Ancients, NGC has provided a valuable service to the ancient coin market. - David Vagi, author and Director of NGC Ancients. Just as the U.S. coin market experienced phenomenal growth after third-party grading of U.S. coins began in 1986, we have seen a dramatic increase in the demand for NGC-graded ancient coins since 2008, and we foresee further growth as the market continues to mature. When we first saw this coin, we were amazed for two reasons. First, the level of detail and quality of the surfaces in these coins are truly remarkable! Secondly, we rarely see the actual head of Alexander the Great on a coin. This piece features him on the obverse and a seated goddess Athena on the reverse. The use of the head of Alexander the Great is due to Mithradates’ alliance with Greek culture, and his claims to descent from the Greek military master. Considered the greatest ruler of the Kingdom of Pontus, Mithradates is perhaps best remembered as one of the Roman Republics most formidable opponents, having clashed in three major battles in the Mithradatic Wars. 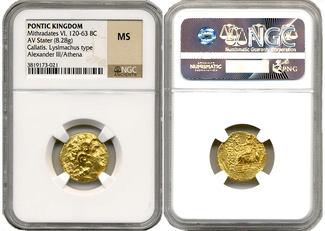 NGC About Uncirculated (AU) and Mint State (MS) gold coins of Mithradates VI (120-63 BC) are currently among the best buying opportunities in the rare ancient coin market, and we estimate less than 100 pieces have ever achieved the grade of About Uncirculated or Mint State from NGC. We have seen such phenomenal price performance of low population U.S. coins over the last several years, so it’s only a matter of time before U.S. collectors and investors begin diversifying their numismatic gold holdings with certified ancients. 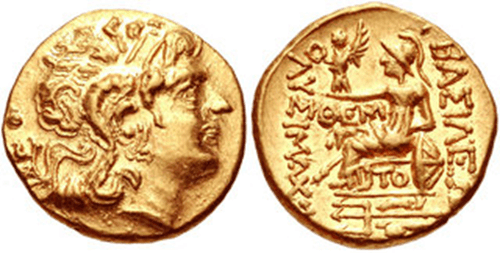 For this reason, we strongly suggest adding the Mithradates VI gold stater to your holdings. Each coin is just over 8.2 grams of gold, struck at either the Callatis or Tomis mint between 120-63 BC, making this coin at least 2,078 years old! Our independent studies of ancient coin values show consistent growth and positive performance. In many cases, the values of ancient coins have doubled in the last ten years. We strongly urge that in addition to bullion, and rare U.S. coins, a truly diversified coin portfolio should include a selection of important graded ancient coins. Call us at 877-340-0790 or send us an email for more information on investing in your first ancient coin or buying an Ancient Coin Portfolio. Ancient coins are the perfect combination of art, history, and rarity. Remarkably affordable with a tremendous future - Hold them in your hands today! *Prices are subject to change based upon product availability and due to market fluctuation.